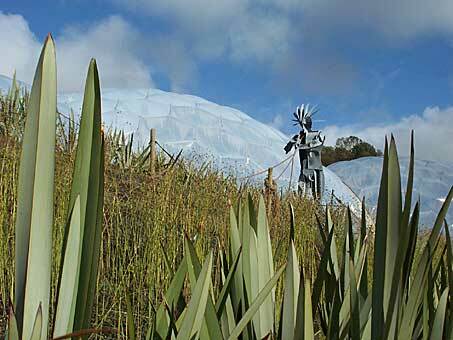 The Eden Project was conceived in 1994 by Tim Smit, who was also responsible for recovering the famous Lost Gardens of Heligan. 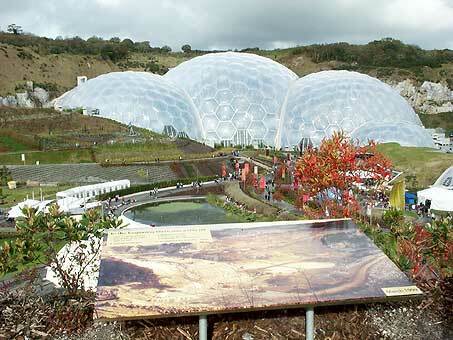 The Eden Project is 4 miles to the east of St. Austell in Cornwall. A location map is here. Grid ref. SX 049548. The Project aims to visually tell the story of man's dependence on plants. 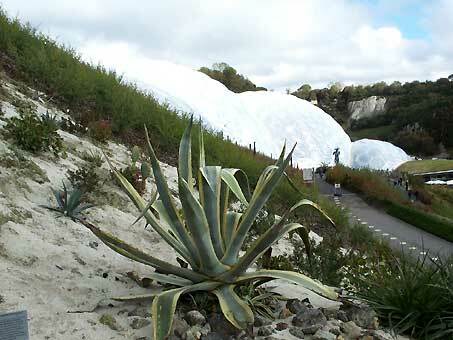 The site chosen for the Eden Project was a former china clay pit; a huge crater, 60 metres deep, south facing and sheltered, but with no soil and prone to flooding. 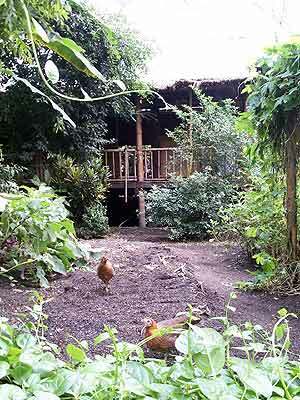 In October 1998 building work got under way but was halted in December after weeks of incessant rain. 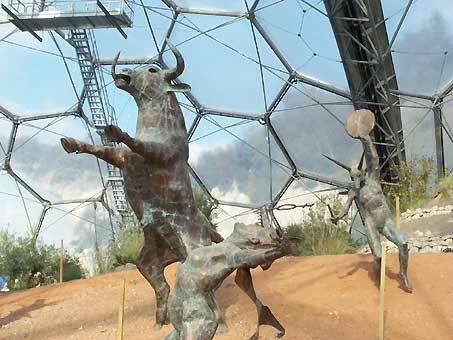 The project opened to the public on 17th March 2001 and by June 2001the millionth visitor had passed through the gates. 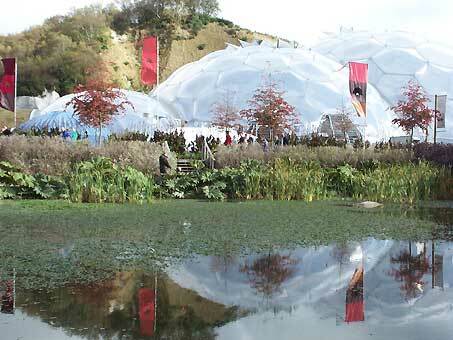 You cannot visit the Eden Project without being amazed at the sheer magnitude of it all. 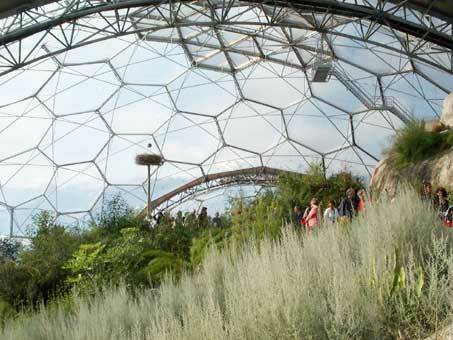 The biome structures (3 pictures above) are the biggest conservatories in the world, split into a 'humid tropics biome' (picture 2) and a 'warm temperate Mediterranean biome' (picture 3). 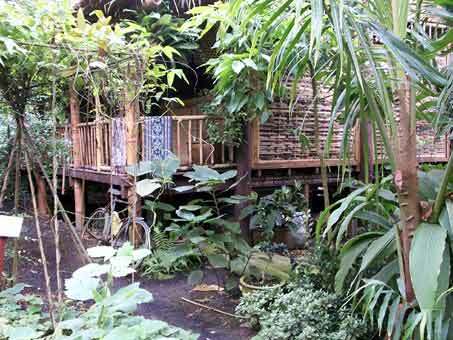 A world record 230 miles of free-standing scaffolding poles were used at the construction stage of the humid tropics biome. 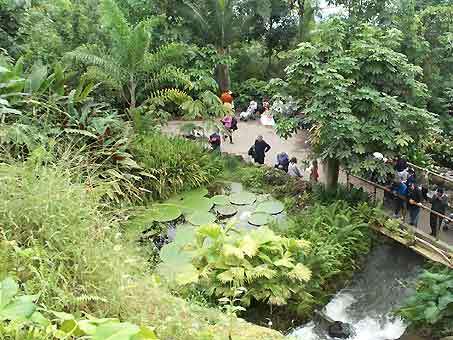 It contains more than a thousand plant species, mist sprays and dramatic waterfalls. The bubbles are made of inflated hexagonal transparent 'plastic' windows with a life-span of more than 25 years, each hexagon being tough enough to take the weight of a rugby team. The structure is made of galvanized steel tubing bolted together and anchored into the foundations. 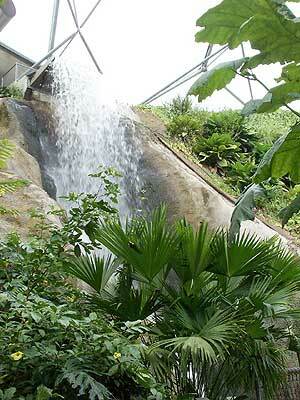 Picture 1 above shows the humid tropics biome. In the foreground is a picture showing how the site looked in March 1999. It's hard to imagine the transformation from moonscape to landscape in such a short space of time. 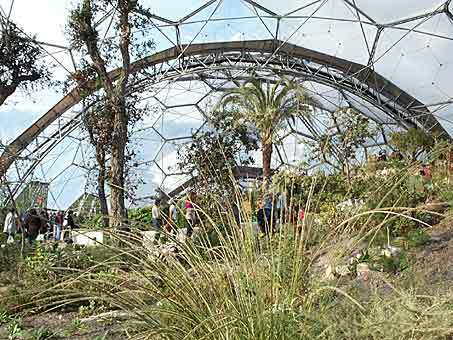 The turf covered structure in picture 2 links the warm temperate biome (on the right of the picture) to the humid tropics biome. 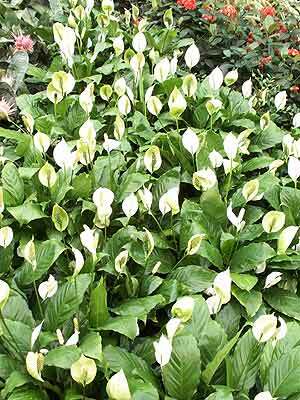 The outdoor landscape includes native plants and plants from the temperate parts of America, Russia and Indian foothills that share a similar climate to our own. The steeper slopes are designed to resemble the Steppes, the Prairies and Chile. A tractor driven land train tours the outdoor complex (picture 1 above). 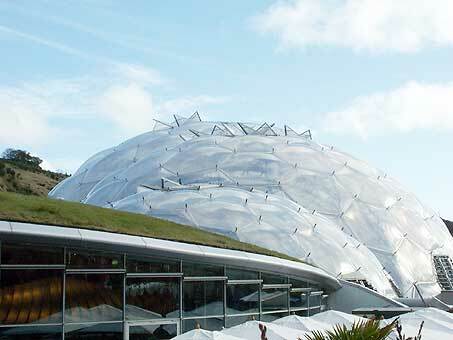 Sculptures and other forms of architecture abound, both inside the biomes and on the outdoor landscape. 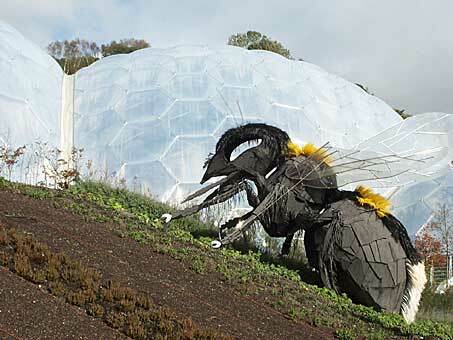 Picture 2 above is Bombus the Bee - created by Robert Bradford. 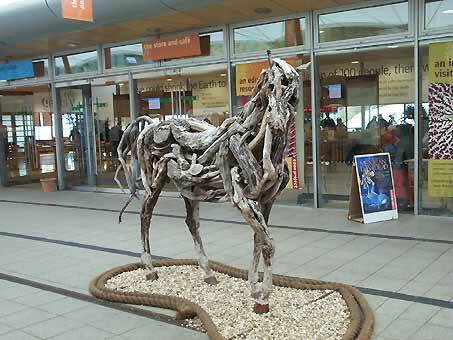 Picture 3 is a 6 metres tall, 2 tonne steel statue of Adam, designed by Cornish artist George Fairhurst. 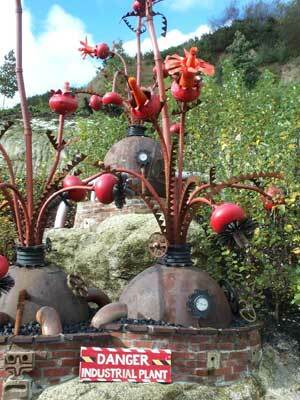 Picture 4 is the quirky Industrial Plant by Cornish sculptor David Kemp. 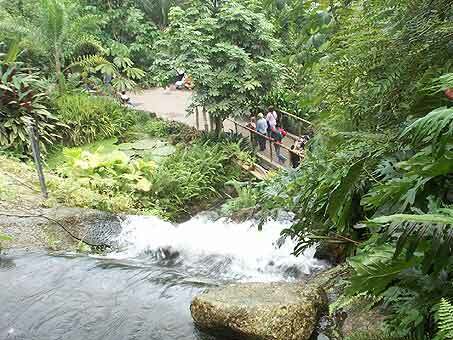 The humid tropics biome is 240 metres long, 110 metres wide and 50 metres high, tall enough to accommodate trees from the tropical rainforests. 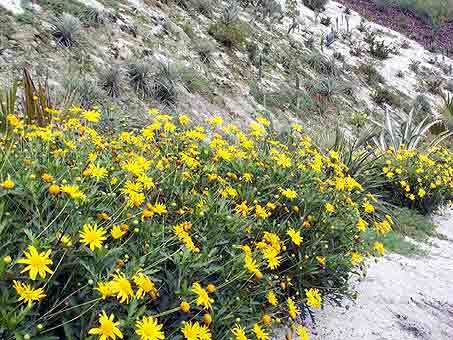 It contains over 1,000 plant species that were planted in September 2000. Air temperature is between 18° and 35° C . Waterfalls (pictures 3 and 4 below) keep the air moist. 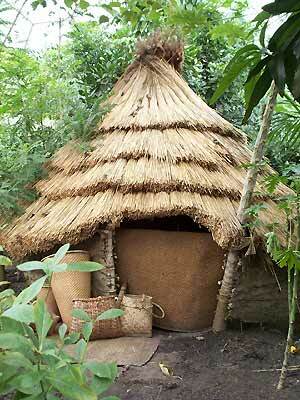 Themes in the humid tropics biome include Malaysia, West Africa, tropical South America and tropical islands. 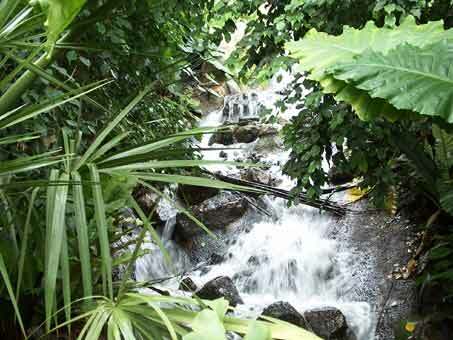 Rainforests have up to 60 inches of rain in a year, but in the tropical biome the soil is kept suitably moist using a soil irrigation system. 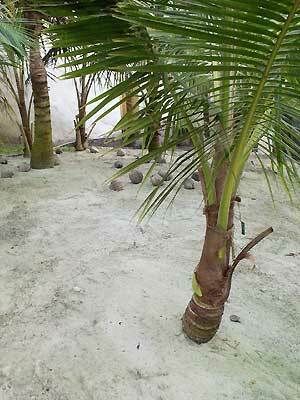 In the controlled environment of the biomes there are insects, butterflies and some lizards. 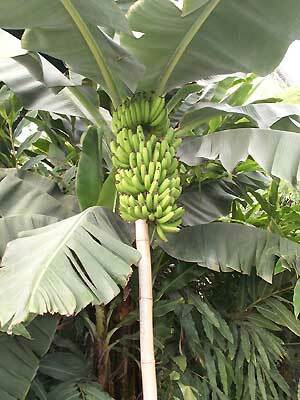 Plants in the humid biome include palms and bananas (pictures 1 and 2), rubber trees, rice, coffee, sugar, pineapples, bamboo, and flowering plants such as peace lilies (picture 3). 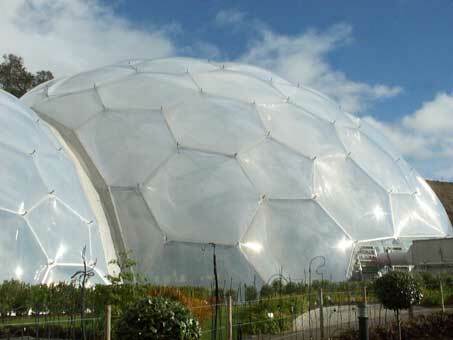 The Eden Project is hugely successful and is visited by almost 2 million people a year. Unlike the other dome (the ill fated and notorious Millennium Dome in Greenwich), these domes were built for a purpose that was clear at the outset. 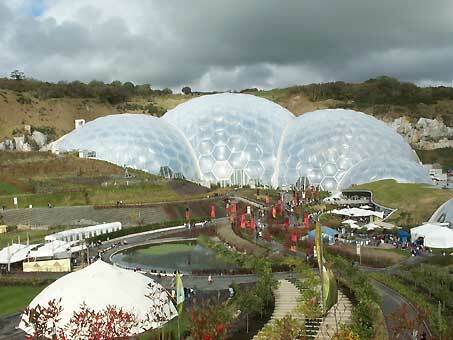 Future plans at the Eden Project include a hotel, a third biome (a semi-arid biome) and an Education Centre. 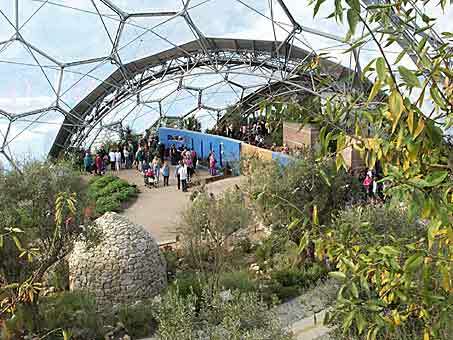 Wheelchair and disabled access:- More than 40 wheelchairs are available at the Eden Project and there are marked routes on site suitable for wheelchair users. Car parking for disabled visitors is close to the Visitors' Centre which has been designed on one level. The land train that tours the steep part of the site has wheelchair spaces and staff are on hand to help. 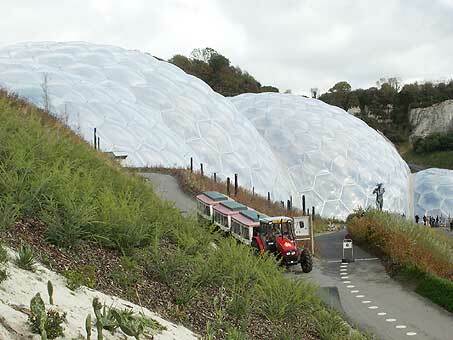 Although the Eden Project has been designed as 'wheelchair friendly' it must be accepted that in a project of this type and on this scale, that not all 35 acres can be accessed by wheelchair.